The street was lined with white tents billowing with colorful paintings, metal jewelry, and fine pottery crafted at the wheel. Main Street is always closed for big events, so we chose the free parking lot at the bottom of the street. There’s a short walk up to the show from here, over a footbridge and up the hill. On the bridge stood a gentleman working on a painting. 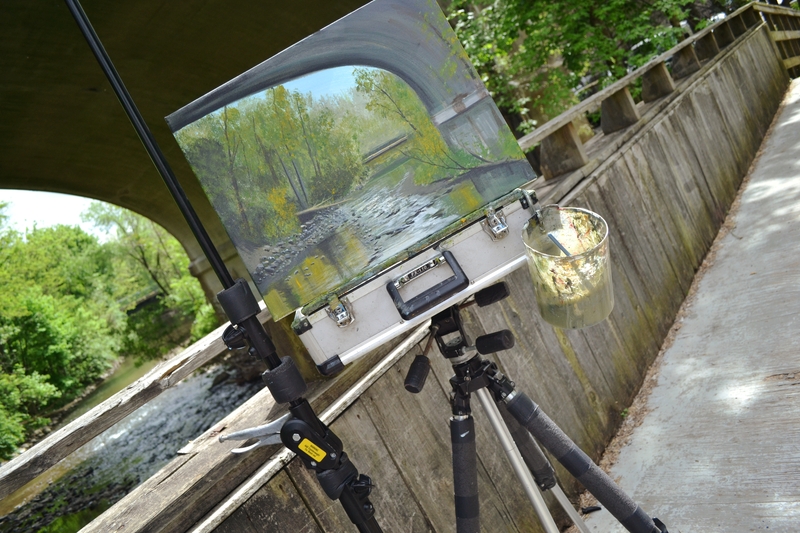 As we approached, we realized the painting was a still of the view from the bridge: the concrete tunnel, the water damage on the side, the river running through with reflections of the branches above. Photographing craft shows can be intimidating as many artists do not want their work snapped up in an image that can recreate their hard work – and understandably so. This gentleman, on the other hand, was open to it as photography was his original profession. 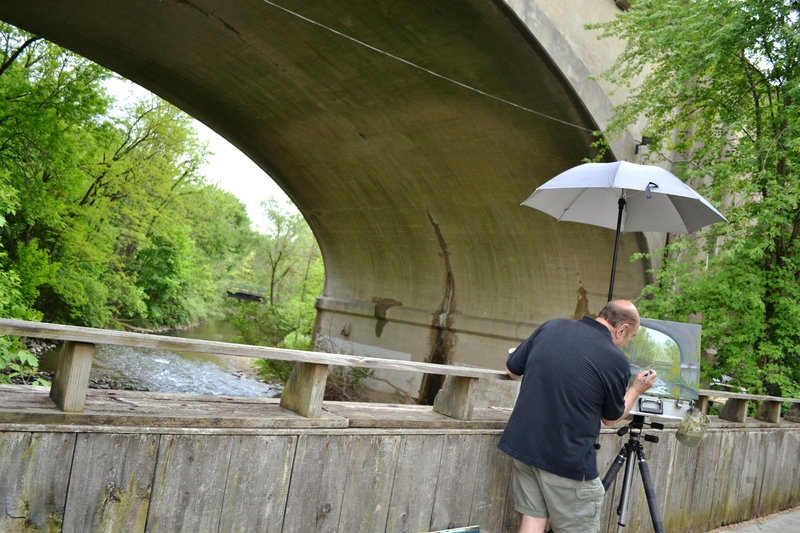 It was then looking at his canvas you saw the easel was a re-purposed camera tripod and his shade was an umbrella flash. His name was Hub Willson – and Hub has some great stock photos of Bethlehem that can be found on his website here. He claimed you need 10,000 hours to be an expert at something – he has 7,000+ hours of painting under his belt, only a handful more to get to expert status as he has with photography. After meeting Hub, we traveled up the hill – getting distracted by the The Smithy where a blacksmith demonstration was taking place. We popped in there to see a man slaving over the heat on this humid day. The most interesting part of the exhibit was the huge bellows by the fire to deliver more air to the fire. Finally, we finished our trek to Main Street to the 50th Downtown Bethlehem Fine Art and Craft Show which is put on by the Bethlehem Fine Arts Commission (BFAC). What an individual has to keep in mind at this particular event is that the products are “fine arts and crafts” – products that were handmade with quality materials. This comes with a price tag, but keep in mind that you are also supporting local arts and businesses which is invaluable and helps breed creativity in our city. A notable stand at the craft show was Mary Gaye Miller’s, who had a collection of mixed media pieces for sale. These pieces were collages of found objects (license plates, old rulers, molding, literature under colored plexiglas) all thoughtfully arranged into grids- some framed and some assembled to make a whole new object. A few examples of her work can be found here. Easton’s Earl the Accordionist was also parading around as patrons browsed the tents. There was also a guitarist strumming melodies into the crowds. We finally ended the craft show by meeting Bella – one of the vendor’s rescued pups. 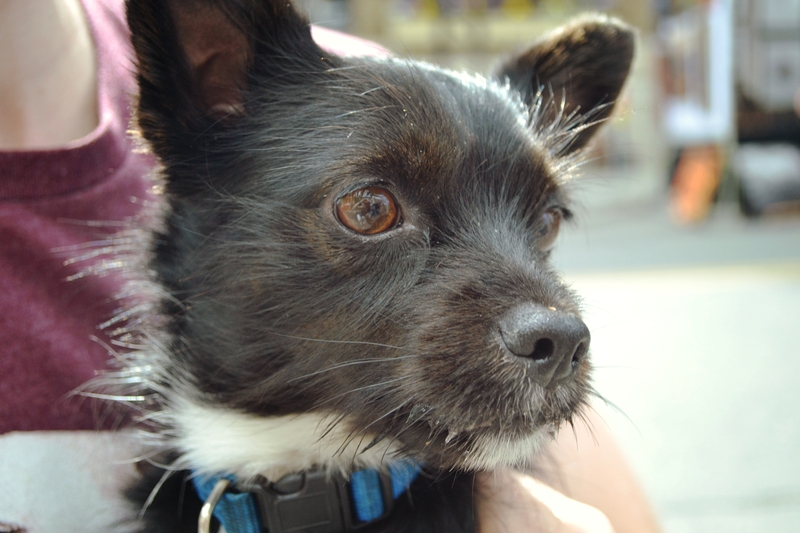 The small dog was black and white with a scruffy coat. Bella was adopted from a southern rescue after being saved from a home where she was abused – so much so, she is without a tongue. You would never know as the dog seemed so happy – now staying with her owner in Hotel Bethlehem during the craft show and living the life as customers gushed over her. Everyone at the Fine Art and Craft Show had a passion to produce their products and every person had a story. Sometimes these two things come together to make one, sometimes one supports the other. Regardless of whether you are purchasing the most unique coffee mug – spun on the pottery wheel and glazed with the same hands selling it, or looking at the mug appreciating its craftsmanship, or simply chatting with the artist – it was the journey around the Fine Art and Craft Show that taught a lot about the destination. Be sure to appreciate the goods and the hearts behind the fine arts. If you would like to dive deeper into personal stories of Bethlehem’s residents – I suggest you check out Stars of Bethlehem.